“Ind” or “Sindh-stan” was a Greek and Persian construct referring to the river Indus as a territorial marker. Historians tell us that it was only after the late 14th century that residents of India began to refer to India as Hindustan. This essentially historical and geographical determination has been taken by rightwing Hindu ideologues to mean that this was a civilisationally unified area, a holy geography in which an Indian is one who sees India both as his Holy Land and his Ancestral Land. This “exclusivist” notion of Indian-ness has become the basis of rightwing Hindutva politics in India. By seeking to exclude those of “non-Indic” religious persuasion whose holy lands are in Mecca or in Jerusalem, for example, it stands in opposition to the modern notion of Indian-ness rooted essentially in the idea of citizenship, in which cultural and religious diversities are not a threat to being Indian. India as a political entity is a modern construct. Until 1947, when Colonial rule ended, India as we know it today had never been a unified political entity ± not under the various imperial dynasties that ruled parts of the geographical entity called India and not even under the British. The colonial legacy left behind a mishmash of British-ruled territory and more than 300 princely states that had been in administrative agreements with the colonial power. These heterogeneous political units lay sandwiched between Muslim-dominated East and West Pakistan. The problem was to create a governance structure suitable for the diverse political units within that geography without any kind of ethnic cleansing and cultural assimilation and recognition of all the states becoming a part of the Union of India. It required the leaders of independent India to develop a cultural identity which could accommodate the cultures of the sub-populations of the various regions of India, and yet also develop a political identity that was national. To understand how this came about, we need to briefly reflect on British rule in India. The British initially ruled Indian through the East India Company, which began with trade and then, by the 1830s, entered into treaties with hundreds of princely states. A year after the mutiny of 1857, the British government took over the administration of India from the British East India Company through an act of British Parliament. Now the question was: What would be the relationship between the Crown and the Indian princely states? The British propounded the “Theory of Paramountcy” ± where the British were the paramount power but the local administration was left to the princes with a British Resident appointed to each State as a channel of communication. While in theory the princes were free to exercise power, in reality they were dependent on the British government for internal and external protection. Their succession policies were laid down by the British Resident. 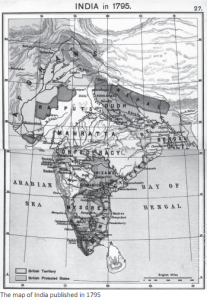 Under the British, India essentially became a unitary state. With Indians demanding freedom, some British and Indian politicians started wondering about the possible structure of independent India. Indian political leaders did not want a moth-eaten India so they proposed a sharing of powers with the princely states to get them to join a united independent India. These efforts which began in the 1920s finally resulted in the Government of India Act of 1935. This Act, for the first time, provided the basis of a “federation of India” between British India and the provincial governments and the princely states, giving large amount of autonomy to elected governments in the provinces of British India. It also provided for a federal court. Those parts of the 1935 Act which were intended to establish the Federation of India never came into operation as there was opposition from the rulers of the princely states. But the distribution of powers under the 1935 Act ultimately became the model for the distribution of powers between the states and the Centre in the Indian Constitution adopted in 1952. After Independence, the Indian Constituent Assembly decided that India was far too diverse a country to be governed by a unitary state. The first factor which propelled India towards federalism was this legacy of history- the attempt to get the princely states under the tent of Independent India. Yet another factor was the need for consolidation imposed on India by partition and a disorderly decolonisation. Nobody wanted India already broken into two, to be divided or carved out any further on religious, linguistic or ethnic fault lines. One would think that under the weight of partition of India, the temptation to form a unitary state and that too probably a Hindu state – would have been strong. This would have seemed a “normal” reaction to the creation of an Islamic Pakistan and the Hindu-Muslim riots that followed. The horrific communal violence and dislocation of people which attended the Partition of India – the Constituent Assembly of Independent India was extremely conscious of ensuring the unity and integrity of the new nation. After debating that too much federalism may lead to secession or aid fissiparous tendencies in the states, ultimately the Constitution makers decided on a hybrid version of federalism- a strong Centre with shared powers with the states. It was a “quasi-federal” structure which combined within it self-rule by the states and shared rule with the central government. The federal structure was the instrument of promoting national unity and accommodating regional diversity, which continues to define India and Indian-ness even today. To do this, the Indian constitution had to recognise linguistic, ethnic as well as cultural diversities and the distinctive social systems that go with them. The geography of India’s states initially corresponded roughly to linguistic identities though language alone was not the basis of creating the states of India through the States’ Reorganisation Commission set up in 1953. Linguistic diversity was also recognised by not having any one single national language but having an astounding 22 national languages with Hindi (spoken only by 40 per cent of the population) as the official language. An Indian currency note has its denomination written in 17 Indian national languages, including Hindi and English. States are free to use their own languages for official purposes within their geographical boundaries. For inter-state communication English is preferred. Once the agitations over linguistic identities were over in the 1960s, subsequent state formation in India especially in the late 1960s, 1970s and even in the 1980s in the North-East of India was on ethnic grounds. So, Nagaland, the home of the Naga tribes, became a separate state in 1963. It was followed by Meghalaya in 1972, where two dominant tribes- the Khasis and the Garos live. Mizoram, where there was a major armed insurgency for secession led by the Mizo tribals, first became a Union Territory in 1972, and later achieved statehood – along with Arunachal Pradesh – in 1987. Arunachal Pradesh has no single dominant tribe or language and the people from different tribes, in fact, use Hindi as a means of communication between themselves. When three new states were created in November 2000- Jharkhand, Chhatisgarh and Uttarakhand- the basis was not ethnicity and language but lack of development in these regions which had been parts of other larger states till then. The point is that Indian federalism continues to be flexible enough to dissipate tensions arising out of diversities of language and ethnic identity as well as tensions arising out of uneven development of regions where self-governance is expected to give better results. Although the Indian Constitution bans secession, there are other mechanisms to meet the aspiration of various peoples for self-governance. The Indian Constitution has changed and been re-written to meet the political desires of fellow citizens provided the unity of the nation is maintained and the basic character of the Constitution is safeguarded. Through such responses to politically articulated demands at various times, the Constitution of India has evolved into an asymmetric federalism so that not all states have the same relationship with the Centre and it explicitly recognises the diverse histories and the changing trajectories of development of the different states of the Union. Thus developmentally backward states such as the hill states of India have special financial provisions and get special incentives. The North-eastern tribal states have special provisions because of their history, culture and geography. Within the states, if there is a specific ethnicity/tribal minority which feels that it needs sub-state autonomy, it is granted such autonomy by the creation of special autonomous district councils. Many such councils exist in India’s North-Eastern states given their ethnic diversity. The twin guiding principles of asymmetric federalism- whether in terms of the relationship between the Centre and a particular State or between a State and the different Autonomous District Councils or sub-state structures within it are: meeting the aspiration of self-rule; and self-rule being inextricably linked to shared rule. Once these two criteria are met, there is enough flexibility in the Indian system to think of innovative federal relationships. It is the simultaneous play of these processes of state formation and nation formation which has resulted in the Indian national identity as we know it today which, unlike many other national identities elsewhere, is not based on any particular religion, language, ethnicity or a dominant homogenising culture. It is based on Constitutionality, the notion of citizenship, and tolerance of linguistic, religious, cultural and ethnic diversity. That is why a Sonia Gandhi, born in Italy, but Constitutionally a citizen of India is as much an Indian as this writer born in Delhi. So are the Nagas, the Mizos, the Ahoms, the Arunachalis, the Tamils, Telugus, Kannadigas or whatever identity one wants to wear. When we Indians say that our nationalism represents “unity in diversity”, we are only trying to capture the intertwined processes of our state and nation building which continue to define India and our Indian-ness. Defining Indian-ness, therefore, is a continuous process of negotiation within the complex possibilities of federation available within our Constitution. commentator on Indian politics. Bharat is currently Senior Academic Consultant to the Indian Council for Social Science Research.